I believe you land on this page to find out what are the possible online business ideas you can start in this year, 2019. Before you start reading, I suggest you bookmark this page so that you can return later as there are a lot of information for you below. I decided to write and publish this post because I find that other articles and blog posts online are telling people that jobs like freelance designers and web developers are also kind of online business they can start but I disagree. I only call something as an online business when it can give you leverage – meaning that you are making money when you are not working. If you are a developer or designer providing a service, you can only make money when you are working on a project. The moment you stop working, your income stops also. Hence, I don’t consider active work like writers, designers and programmers as online business. *Unless you write and publish books or create graphics like icons as digital products to sell or create software / apps to sell – then these are considered as online business. The following are five different online businesses that I want to share with you so you can consider them seriously and start in Singapore (or in other countries). The most important thing is that the following business models can give you true leverage – you can make money while you are not actively working. But this does not mean it requires little or no work, please do not be mistaken! Online business is like any offline business too, it takes effort to setup the system and market it well. Once you have the system running, you can then enjoy the fruits that leverage brings you. I hope you are able to find one that suits you, good luck and hope you find my sharing useful! Special note: Some of the links below are my affiliate links where I recommend some useful resources or tools I use. You have no obligation to sign up anything below via my affiliate link if you do not wish, but if you do, I thank you for your appreciation! Kindle Direct Publishing (KDP) is created by Amazon. It allows anyone to publish books (physical and ebooks) on Amazon and Kindle store for worldwide readers to purchase. It used to be very hard to publish a physical book (you have to find a local book publisher and pay them a hefty sum) but ever since the rising of KDP, anyone can just create an account here and upload a Microsoft word file together with the cover image, and your book (physical and ebook) will be available for purchase by anyone in the world! The reason why I like KDP is because it is free to join and Amazon will not charge me any printing costs until someone ordered my physical book online. Read on to find out how the revenue model works. A list of KC’s kindle and physical books available for purchase in Amazon. Regarding the earning potential, it depends on how many people purchase your books and what are the price you set for your books. The potential is huge if you nail a niche that is your expertise and also has great demand. In addition, the chances of selling your book is higher if you have a book online for 300 million customers (Amazon customer base) to purchase as compared to a local bookstore. There are three methods to make money from KDP. The following is a list by Amazon where you can see how much you can make based on the price you are selling. From the table above (this is the first method), you can see that if you want to make 70% of your book price, you need to price your kindle book between USD$2.99 to USD$9.99. For example, if your kindle book costs USD$2.99, then every purchase will give you USD$2 profit. If your kindle book price is outside of this range, then you only make 35% of the book price. As for the second method, it is for physical book, they will tell you what’s the minimum to cover the printing cost and anything you set above the minimum, you make 60%. For example, one of my book cost USD$2.15 printing cost, and I set the physical book price as USD$7.99, hence, 60% of ($7.99 – $2.15) is USD$3.50 (which is my profit every time a physical book is ordered). For the third method of earning, which is only applicable if you optin for their KDP select program. This means that you can’t sell your kindle books elsewhere but you get to earn if Amazon customers borrow your kindle book and read it. You will earn an income based on how many pages your readers have read. I like this model because it adds on to the income every month! The following is a screenshot of how many pages my books have been borrowed and read over a period of time. There are a lot of authors making a living just from KDP and Steve Scott is one of them. He earns 5 figure a month selling kindle books on KDP. While we are on this, let me manage your expectation here, not everyone can earn 5 figure from KDP. As in all businesses, it requires effort, persistence and some factor of luck as well. The reason why I mention Steve in this blog post is to let you know that there is huge potential selling low ticket items in today’s new economy because of the power of leveraging through Amazon and other Internet platform. It does not mean if you sell your kindle book at $2.99, you won’t be making any significant money. What if there are thousands of people buying your kindle books every month? Some popular books can have 3000 to 6000 sales per day, so there’s really no limit to KDP potential. If you asked me, KDP is one of the easiest business to start online for beginners. One of the key reasons is because it does not require any money to start and also, it does not require technical knowledge to set up a website. You don’t even need a website to get started with KDP. How passive is KDP business? KDP is one of the most passive income you can get online. Once you published your books online, there is no need to support your readers by answering their questions (unlike the next business model I’m going to mention below). However, you need to have a marketing system in place to market your books so that they will sell. I will share more about marketing in my future blog post. What do you need to do well in KDP? In order to do well in KDP, either you must write your own books, or you can get other people to read the book for you. If you are writing your own book, then you need to have good writing and proofreading skills. If you are getting other people to write for you, then you would need to have some budget to hire writers. You can check out HireWriters to get people to write kindle books for you. How much you need to start KDP business? If you are writing your own book, then you do not need any money to start. Unless you want to get someone to design your book cover for you. You can go to Fiverr (search for ‘kindle book cover design’) and get a kindle book cover designer to design a good looking cover for your book. It costs from $10 to $50 depending on the quality and addons you want. First, you need to create a KDP account here. If you need some training on KDP, you can consider Stefan James’s course here. Stefan is a popular Kindle author who earns 5 figure from KDP as well. Otherwise, you can also consider my KDP course for beginners (who want to outsource the writing) here if you are looking for some training on KDP business. If you are not keen to make money with kindle books, but is keen to share what you know, then perhaps you can consider becoming an online course instructor. You may already know that I have been a full-time online course instructor since 2014 and at the time of this blog post, I have more than 50,000 students enrolled in my courses. As an online course instructor, what you do is to share what you know in a video. You can appear in the video or you can just show the PowerPoint slides or your computer screen in the video (commonly known as screen-cast). For me, 99% of my videos are screen-cast, I don’t appear in my online courses. Instead I only speak and show my students my computer screen. 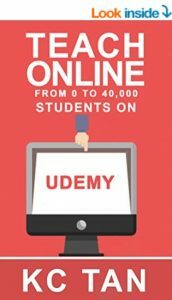 Udemy.com is definitely the first place to go to if you are keen to start as an online instructor because they have 24 million students looking to learn new topics every day. You can click here to see some of the latest statistics from Udemy. Ever since I started as an online instructor with Udemy, I rarely promote my own online courses because Udemy has always helped me promote my courses. This is the main reason why I decided to work with Udemy from the beginning. I’m very glad to have most of my students coming from overseas instead of my country, Singapore because I know that the main reason for me teaching online is to reach out to more people in other countries! Now, enough of my story. Let me share with you what are the three revenue models Udemy runs. Once your course gets approved by Udemy, I strongly suggest that you optin to their marketing and promotion program – where they will use smart pricing tactics to sell your course by giving discounts. The first revenue model is when you sell your own courses (by giving discount codes to your contacts or customers), you will receive 97% of the fee. For example, my course costs USD$200 and I can create a discount code that gives 50% off. If my friend sign up my course using this discount code, Udemy will pay me 97% of USD$100, which is USD$97. The second revenue model is when your course is sold by Udemy website, then you will receive 50% of the course fee. For example, if Udemy sells your course for USD$50 to a student, then you will receive USD$25. The third revenue model is when an Udemy affiliate sells your course, you will receive 25% of the course fee. For example, if an affiliate sells your course for USD$40, you will receive USD$10. You can view the latest revenue share structure on Udemy page here. Udemy has a comprehensive page to share with you what are the audio and video recording equipment that they recommend. You can find the recommended list here. Besides Udemy, there is also another website called Skillshare where you can upload your courses as well. Although skillshare is not as popular as Udemy, but it is still another stream of income from your online courses. In addition, once you have an online course, it is easy to duplicate it onto other platforms. Is becoming online course instructor for beginners? Unless you have some experiences in teaching or training, if not, it will be harder for you to start as an online instructor right away. But if you have years of experience in a topic that you truly believe that more people can benefit from it, then go for it! It is always the first course that is going to give you a tough time. Once you get your first course approved, your second and beyond will be piece of cake! How passive is this online course instructor model? Becoming an online instructor is not a 100% passive income because as the number of learners in your course grows, so do the time that you need to answer the learners’ questions. Nowadays, I spent 30 to 45 minute everyday answering to all the questions posted by the learners. Comparing to KDP (the above model), this model is not as passive. But on the other hand, you can charge more for an online course as compared to a kindle book. What do you need to do well as an online course instructor? After teaching online for several years, I find that in order to do well as an online instructor (to at least make a living), you must have the heart to teach and help your learners to succeed. Whenever your learners have questions, always answer them and thank any learners who helped to answer other questions also. Another important trait of a successful online course instructor is that you must be able to explain complicated concepts / ideas in very simple terms. I find that learners will eventually give up and quit an online course if they are confused. So always aim to say simply and express your ideas in very simple words because you may not know that what is the background of your learners, they can come from anywhere in the world that you hardly imagine. How much you need to become an online course instructor? If you are just going to show slides or your computer screen inside your video (instead of yourself), then the expense is not high. 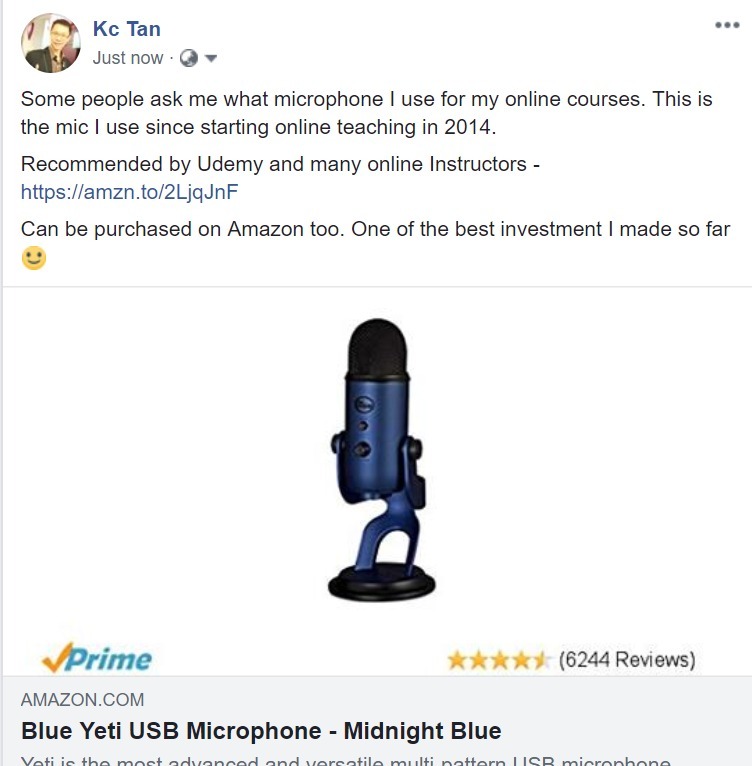 It is free to join Udemy and all you need to invest is the screencast software ($1.50 per month) I mentioned above and the Blue yeti microphone ($100+). Please note that a professional microphone is required as Udemy take the audio quality very seriously so do not use any headset with mic or your laptop built-in microphone as they are not as good. Resources to become an online course instructor. You can sign up as a Udemy instructor here. Check out Udemy’s conference (2017) to listen and learn more from the speakers. Browse the Udemy official courses (free) to learn how to create your first course! Just an ending note as an online course instructor, if you are someone who values career satisfaction, then this is something that you can seriously consider. Ever since started teaching online, I have received many emails, personal messages thanking me for the things I teach in my online course. I even met up with my learners when they drop by Singapore, and we became friends and maintain contact. Words and feedback from my learners are great motivations for me to continue support all my learners and create more courses! I have been in affiliate marketing since 2005 and I must say this is one of my favorite online business because it doesn’t require me to create any products, I just simply leverage other people’s products to make a profit. First thing first, what is affiliate marketing? It is a business model where you help to promote a product / service for someone else and when there’s sales from your referred traffic, then you will make a commission. For example, you obtained a special affiliate link from Qoo10.com on a product (watch a video here on how to get your affiliate link for Qoo10), let’s say it is a pair of sports shoe. And you share your affiliate link on your facebook page to tell your friends this pair of shoe, some of your friends might click on your link and purchased the shoe, if this happens, then you will earn a percentage of the sale. This is how it works. The reason why Qoo10 will know that you are the one who referred the sale is because everyone has a different affiliate link, therefore, it is unique. On top of this, you also have a different affiliate link for each product so that Qoo10 will know what product you promote. Amazon – Amazon is one of the top online stores that sells almost anything. Once you become an affiliate for Amazon, there are tons of things you can promote for commission. The one downside for beginners is that Amazon requires you to have a website in order to join as their affiliate. ClickBank – While Amazon contains mostly physical products, clickbank’s marketplace consists of most virtual products like eBooks, videos, software, graphics and audio. A good news for beginners is that Clickbank does not require you to have a website. So anyone can start with Clickbank. Jvzoo – Jvzoo is like clickbank but it is more affiliate friendly as it gives affiliates more control like offering bonuses along with the product that you are promoting. Jvzoo has a lot of software that help business owners to market their services. So if you have a list of people running websites or businesses, then jvzoo is definitely one of the first places you can start. In addition, you do not need to have a website in order to apply as an affiliate. iherb – iHerb is an online store that sells organic supplements. If you are someone who buys supplements online, do try out iherb. They are getting more and more popular these few days. Their affiliate program is called iHerb Rewards, you need to be their customer in order to be eligible for their rewards program. MarketHealth – Markethealth is an affiliate program that allows you to promote health and beauty programs online. Unlike the above affiliate programs where you were paid for sales, markethealth has programs that pay you for leads. This means your referred traffic just need to fill up a product trial form and you will receive payment. One good thing about markethealth is that you do not need to have a website to apply too. One of the easiest ways to earn affiliate income is to share affiliate products in your social media profile like facebook, linkedin or Instagram. For example, you recently bought a bread maker on Qoo10 and you find it useful so you obtained an affiliate link for that breadmaker and share it in your facebook and talk about how you use it to make organic bread every day. If anyone in your profile clicks on your link and purchased it, you will make a certain percentage of commission. The advantage of this method is that it is fast to set up and you do not require a website to keep it running. The disadvantage is that the potential of your income is limited to your friends circle. If you do not have a lot of friends in your social media, then you will not be getting sales. An example of how I share a microphone that I use for recording courses online. The next method is to create a website or a blog to share reviews on certain products. You can read that in this blog post, I talked about Vodien hosting and some of my experiences. That blog post is ranked on first page of Google and I have affiliate income generated off that blog post from time to time. If you create a website or blog, then the earning potential does not limit to the people you know. Because the visitors of your website can come from anywhere such as via Search Engines, referrals or direct traffic. Your reach will be wider if you leverage a website or blog. The disadvantage is that it takes time and effort for you to plan and write the content to convince people to buy the product(s). 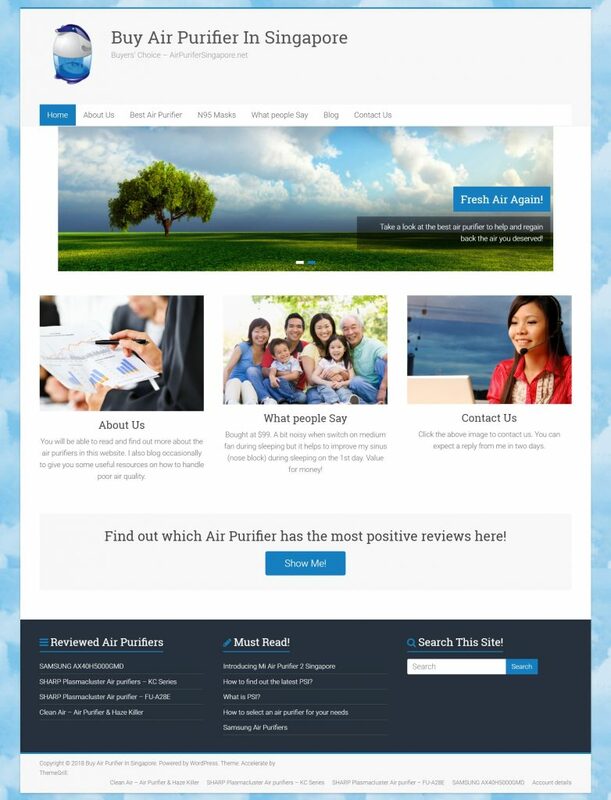 Instead of a blog post like the above example, you can create a website that focus on a niche product like this website – Air Purifiers Singapore Review. In that website, you can see that there a few models of air purifiers but no matter which one you click, you will be directed to Qoo10 website. This means all visitors who clicked on the links are tracked via my affiliate links when they purchase any items in Qoo10. The most effective method of promoting affiliate products is via mailing list. But this is also the most time consuming method but once you have a list of responsive subscribers, it takes very little active time to make affiliate income as most of the emails can be automated. Take for example, currently I have thousands of subscribers in my free online course mailing list. Once someone subscribed to this mailing list, they will receive emails from me (scheduled and sent out by the system) to teach and share with them some of the online business tips. Occasionally, some emails contain affiliate links to products I use and promote, hence, if someone purchased the tools I recommend, then I will earn an affiliate income from there. All this happens without me sending the emails myself because all these have been automated. As I have mentioned earlier, the toughest part is in the beginning where you need to write emails and strategize which day to send out which email. 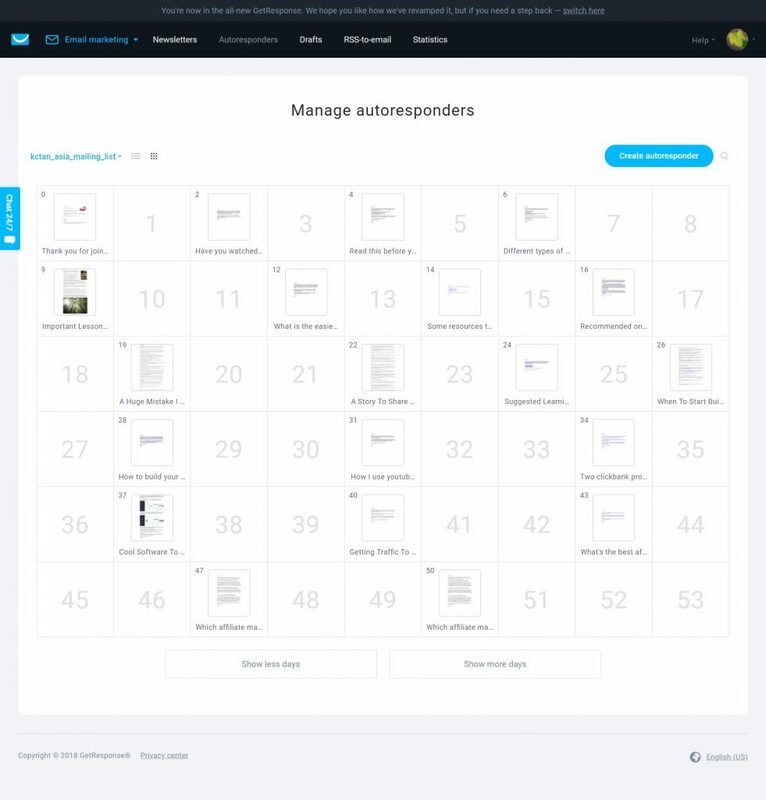 A glance of all the emails I scheduled for my subscribers using an autoresponder system. The earning potential of affiliate marketing business is huge. Pat Flynn from Smartpassiveincome is making 6 figure income every month and most of his income is derived from affiliate marketing. You can also read more about affiliate marketing using authority website model over at Authority Hacker blog. Again, just want to manage your expectation here that not everyone can make 6 figure off affiliate marketing especially in the beginning. As with other businesses, it takes a lot of time, commitment, trial and error to achieve something worthwhile. Yes, definitely. In fact, affiliate marketing is easier to start compared to KDP. Anyone can sign up with one the affiliate programs I mentioned above and start promoting any products to their friends to experience how affiliate marketing works. How passive is affiliate marketing? Affiliate marketing is very passive if you have setup a fully automated leads capturing and auto-responder system to send out emails for conversion. In most cases, affiliate marketing still require some active work like copywriting and blogging to generate income. In order to make it truly passive, always put your focus on building your own mailing list so that you can monetize it by promoting various offers in future. What do you need to do well in affiliate marketing? To do well in affiliate marketing, you must first understand the concept of traffic matching. This means you need to first identify the audience before selecting a product to promote. Read this blog post for all about traffic matching. Second, you need to learn copywriting – the art of writing copy that gets people to buy. This is an important skill for anyone to take up if you want to run a profitable online business. How much you need for affiliate marketing? Resources to start affiliate marketing. Read this blog post on more about affiliate marketing singapore. Books recommended to learn copywriting. Blog post on best affiliate product to promote. Another type of online business you can consider is called the reselling model, or commonly known as the white-label model. Reselling means that you are providing a service / selling a product but the actual production or operation is done by another company. But to the customer, you are the one who is handling everything, the customer do not know who you work with. For example, Vodien is a company that provides web hosting services in Singapore. They also have a reseller business model for people who wants to become their reseller. Once you signed up as their reseller, you will be given an online store that you can upload your own company logo and run a web hosting business! Anyone who purchases the services from you will have their website hosted by Vodien, in terms of operation, Vodien will handle them. As a reseller, you will handle the marketing of the website and the support. A reseller website selling vodien’s hosting services. As you can see from the above, becoming a reseller has the advantage of leveraging an existing company for their operations and products. So you do not need to create your own products to sell (unlike KDP and online teaching). But the disadvantage of reselling is the products and services are not controlled by you, directions and focus might change for any company and such changes will impact your reselling business down the road. If you are keen to start this reselling model, I would suggest you choose a popular and big company to resell their products. Companies who have been around for sometime (more than 10 years) are less likely to have drastic changes in their product line. Some people are confused between affiliate marketing and reselling because most companies that offer reselling also offer affiliate opportunities. Here’s the difference, as an affiliate, your visitors are directed to the company website and so this means your visitors know who is selling the actual product. As an affiliate, you do not need to provide support for the customers. But as a reseller, you will have your own website (most of the time, a website will be given to you by the company) so your customers will not know who is the actual company selling the products and you need to answer questions coming from your prospects and customers. Comparing to affiliate marketing, the advantage of reselling is that you can have a higher profit margin because you set your own price. The disadvantage of reselling compared to affiliate marketing is that not only you need to market your website, you also need to support your customers in terms of pre and post sales. Hence, you need to have good knowledge about the things you are selling. Vodien Hosting – sells domain name registration and web hosting services. SEO Reseller – sells SEO and other online marketing services. Mozello – sells website DIY software like weebly, wix. Appypie – sells online app creation software. 99dollarsocial – sells social media management services. Is reselling business for beginners? In general, reselling business is not for beginners unless you already have a solid understanding of the products that you are selling. For example, if you have been using Appypie to create apps for businesses, then you will find it easier to sell Appypie because you already understand how it works. Or for example, if you have a very good understanding about how web hosting and servers work, then you will find reselling web hosting services work for you. If you have not started any online business before, I would suggest you begin with affiliate marketing first before you try out reselling. This way, you just need to focus your time on marketing and not worry about the support. How passive is reselling model? Reselling business is not passive because you need to support your customers. Unless you have enough customer base to hire a support personnel, if not, you will need to provide support to your existing customers and inquiries coming to your website. What do you need to do well as a reseller? In order to do well as a reseller, you need to have a very good understanding of the products that you are selling and also, know where you can find your customers. This often comes with work experience so take your time to explore any possible reselling opportunities whereever you are. How much you need to become a reseller? Most companies require a sign up fee to become a reseller, hence that is the main cost you should consider. For example, Vodien charges a $100 upfront reseller sign up fee. 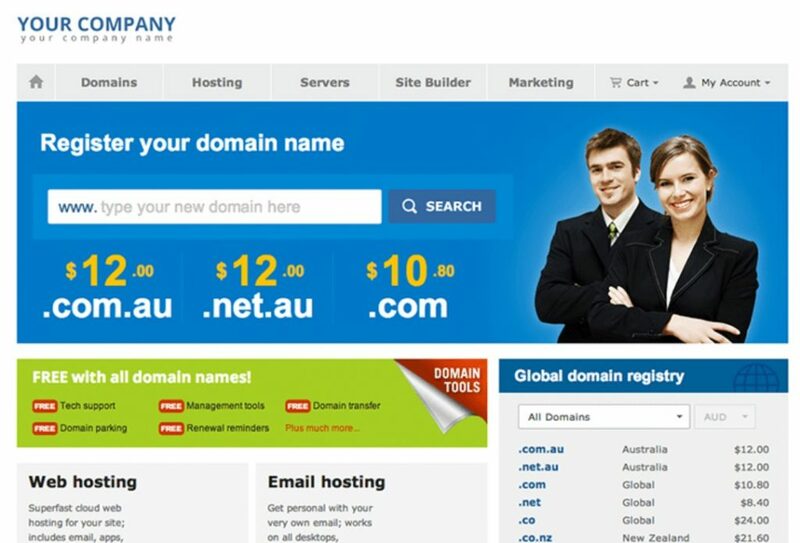 Other fees that you should consider is the domain name of your website and how are you going to market your website. Resources to become an online reseller. Do check out the company website that you want to become their reseller as they often have training programs and resources to educate new resellers. The last online business model I want to share with you is website investing. Similar to investors investing in properties, you can apply the concept on websites as well. For example, you can invest $2,000 to buy a website that generates $100 per month, and the income you get is like what landlords receive as rental income. Or you can buy over a website for $2,000 then improve it and sell it for double the price in future. It all depend on your website monetization skills. Flippa marketplace where you can buy websites from. One common way of how website makes money is to sell products and services. Buying such a website can be difficult because you also need to deliver the products / services after you take over the website. Unless the website uses the Reselling model that we have discussed above, else, it will take up a lot of your time fulfilling the products or services. Personally I will not recommend anyone buy a website that sells their in-house products / services. This is a more passive approach compared to the above. There are also a lot of websites that setup for the purpose to promote other people’s products or services. This is commonly known as affiliate websites. This kind of website is more passive to run and maintain as you do not need to fulfill the products and you also do not need to support the customers. This kind of website is comparably cheaper than the following website most of the time. Another common method of how website makes money is to sell advertisement space. In order to make significant income selling advertisement space, your website needs to have a lot of traffic (minimum 100,000 unique visitors per month). Thus, it is often quite expensive to acquire website with such high amount of traffic. Where can you buy websites? Flippa – Flippa is one of the oldest platform available to buy and sell websites. When I started buying and selling websites around 2010, I use mainly Flippa to sell my websites. I like Flippa because it is very safe to transact there as Flippa also offer escrow protection so it mean only when the website has been fully transferred to you then Flippa will release the payment to the seller. Empire Flippers is another popular online marketplace where you can buy money making websites. Personally I have not used it before but I have been hearing good feedback online from others and hence I include this website here for you to check it out. From my first glance at Empire Flippers, it seems that the websites generates higher income than those listed on Flippa. Of course, with the increased earnings, the sellers there are looking at a higher price too. Shopify Marketplace – You may not know that Shopify has an online marketplace where you can buy over existing online stores and run them. If you do not know, Shopify is a popular online website that allows ecommerce owners to setup an online store easily. Thus, this online marketplace is a place where you can check out some of the profitable stores to take over. Just a note, most stores listed there operates using a dropshipping model – which means if you take over the store, you do not need to manually deliver the items to your customers, instead, you simply need to inform the dropshipping contact and they will deliver the product for you. This dropshipping models is somewhat like the reselling business model I mentioned above. When buying over a website, always check and see what are the current traffic sources for the website. My favorite source of traffic is Google Organic, simply because if most of the traffic comes from search engines, it means that the website is well indexed and is ranking high. Such websites has the higher potential for growth. I like to see a website with at least 50% of its traffic coming from search engine (organically). There are also other types of traffic like Direct, Social and Referral. If you are buying a website that has top traffic source coming from Social, then check and see if the website price includes the transfer of the social profile too. Most listing will include that as well in the price. If you see the referral source is giving the website a lot of traffic, then you can ask what are exactly the websites so that you can take a look if those links are permanent or temporary. A screenshot of a website analytics listing showing its traffic sources. Besides the traffic source, also take note of where are the visitors coming from. It is better to purchase a website that has most of its traffic coming from Tier 1 countries like U.S, Canada, U.K and Australia etc. This is another thing for you to take note. Number 2 factor is the buying price. You need to first understand what is the budget that you have to purchase a website. Typically a website is sold at the price of 20 to 40 times the monthly profits. Hence, if you have a budget of $2,000, to $4,000 you can probably buy a website that generates about $100 per month. I would suggest to keep your budget minimal especially if this is your first time buying a website. The next thing you should consider is how the website makes money. If you read the listing description, you will know if the website generates income either through its products sales, advertisement space or affiliate income. If it is through product sales, you need to check with the seller if it is dropshipping model and will he/she teach you how to operate it after the transfer is done? If the income comes from affiliate channels, do make sure that you have the affiliate account with the respective company. For example, if a website lists down all sports products from Amazon and makes money via affiliate links, do make sure that you have a Amazon affiliate account so that once you take over the website, you can edit all the affiliate links to include your id. If the website earns money via advertisement space, then it is pretty straight forward, just make sure you ask to have the contacts for those advertisers so you can follow up. This factor is very important because some websites require high cost to run every month. For example, if the website requires a dedicated hosting, then the hosting fee will be in terms of hundreds to a few thousands per month. Make sure you check how much is the seller paying for the hosting now. Besides the hosting fee, ask the seller how much money is he investing right now to generate this amount of sales because most likely you need to set aside the same amount of advertising budget too. The last point to check with the seller is what are the other things that require to renew for the website, for example, is there any reseller fees? Software license fees etc? This is something that most new buyers over-look because it is not so obvious upfront. Most websites, especially those that have high percentage of traffic coming from search engines, are content driven. This means that if you stop publishing content, your traffic will drop. Hence, you need to ask the seller how he/she creates content and if they outsource it, do ask them for the writer’s contact. Of course, if you think you can create even better content, then do it yourself, this is the best approach. You also need to check with the seller what software is the website based on? Is it wordpress? Or other CMS (Content Management System)? Or is it customized coding? If it is a customized solution, do you have the right technical know how to manage it? The above are the five important considerations that I believe will help you before you buy a website. Is website investor for beginners? Definitely not! I only recommend you explore buying website when you are more familiar with how a website runs and how it makes money. You can start with other online business models and down the road you will gain more experiences online. How passive is this website investing model? It depends on the type of website you purchase. If you purchase a content driven website, then you will need to either write the content yourself or outsource to someone else to create the content. If you purchase a website that promotes affiliate products, then you just need to make sure your traffic source is consistent and advertise in the right channels to bring in sales. What do you need to do well as a website investor? You need to first understand how a website makes money and then explore even more channels at how you can increase the revenue for a website. A good place to start is Flippa where you can go through every listing and also see what questions other buyers are asking. This way, you will learn a lot before you make your first purchase. How much you need to become a website investor? This really depends on the revenue of the website that you are buying. Typically, most websites are transacted at monthly profits x (20 to 40). For beginners (even you have the budget), I suggest you purchase websites that is earning below $500 first. Resources to become a website investor. Website buying and selling guide by Flippa. How to buy a website faq by empire flippers. How to buy over an ecommerce business eBook by Shopify. So that’s the 5 online business ideas you can start! I will be publishing another detailed blog post on marketing! In the meantime, if you have any questions, you can join our closed facebook group here and ask! I wish you all the best in your online business! Can You Still Make Quick Money Online? Introducing my blog's main sponsor – A1 Business! Announcing New Online Course for Financial Advisers! 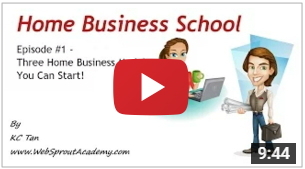 Subscribe to our YouTube channel for educational videos on creating an online business! Subscribe to my YouTube channel for educational videos on creating an online business!